Up to 24 drones will take off from locations across the U.S. The air traffic control tower at Moffett Field, California, on July 30, 2015. A NASA-developed air traffic control system for drones could take a major step forward this week when up to 24 drones take to the skies from locations across the U.S. in the agency's first coordinated test. Called UTM, for unmanned aircraft system traffic management, the platform is seen as a key safety system that would allow greater numbers of drones to fly in the sky and avoid mid-air collisions with piloted aircraft and other drones. It allows drone operators to enter a flight plan and request clearance for the flight. The system checks the plan for conflicts with other planned drone flights and accepts or rejects it. For example, a farmer could program a drone flight above her land, effectively reserving it for a certain period of time, and then carry out the flight in the knowledge that a delivery drone scheduled to arrive at the same time will automatically calculate a path to avoid a collision. This week's test will be controlled from NASA's Ames Research Center in Silicon Valley, where much of the development of UTM has taken place. Weather permitting, up to four drones will take off from each of six Federal Aviation Administration (FAA) drone test areas in Alaska, North Dakota, Nevada, New York, Virginia, and Maryland. A site in Texas will also participate, weather permitting. It will be the first time NASA's UTM platform has been tested with multiple sites and with coordinated flights across FAA test sites. NASA also expects it to be the most simultaneous, live UAS flights to date under the UTM research platform. NASA held a drone flight management symposium at Ames Research Center in July 2015 when several elements of the system were demonstrated. It used to the event to call on companies in the drone industry to participate in the development of the system. 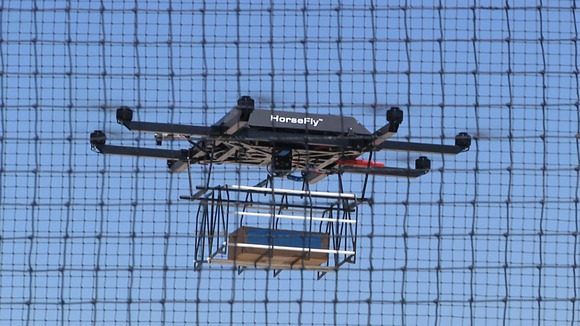 A delivery drone from Workhorse during a demonstration at Moffett Field in Mountain View, California on July 28, 2015. The need for a coordinated drone flight management system was underlined on Sunday when the pilot of a British Airways flight on approach to Heathrow Airport near London reported a collision with a drone. The aircraft was at 1,700 feet at the time -- well above the safe altitude to fly a drone in controlled airspace -- and suffered no damage. Police have asked the public for help in identifying anyone flying a drone in the Richmond Park area of the city on Sunday morning. "The incident highlights the very real dangers of reckless, negligent and some times malicious use of drones," said Chief Superintendent Martin Hendy, head of the Metropolitan Police's aviation policing command, in a statement. "One of the challenges is to ensure people realize what is legitimate and what is illegal. The message is, do not fly them anywhere near airports or flight paths, or over crowded places such as football and other stadiums. The potential is there for a major incident," he said.